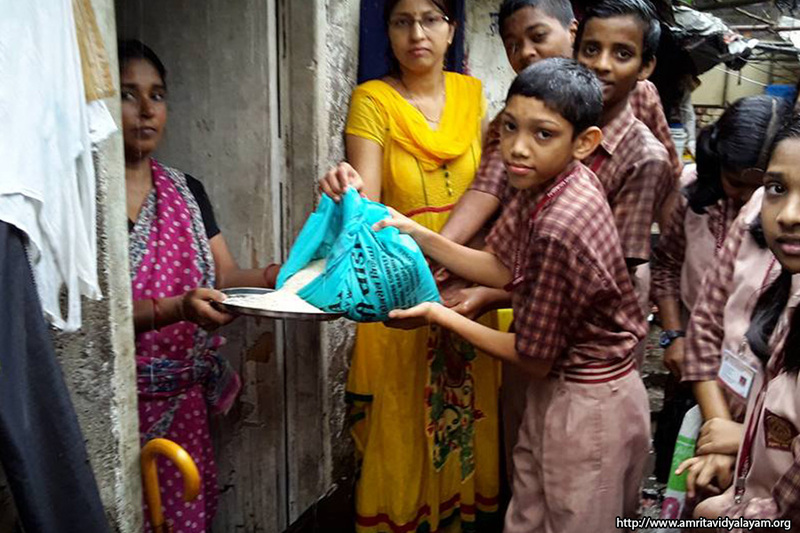 The Sevamritam Project Students and teachers braved the heavy rains and reached out to 29 families adopted by the school and distributed kits of rice, wheat, oil and blankets. The students were moved by the plight of families living in makeshift tents and felt truly grateful to their parents who provide them with so many luxuries. Many students were ready to donate their toys, books and stationery, and even come to share their birthdays with these families. Sealing of Desires The money collected (Rs.4300) was used to purchase oil, wheat and blankets which were distributed to the 29 families adopted by the school. This was done along with the Sevamritam Project. On seeing young children living in the slums shivering with cold, students were extremely moved, and this helped them to understand how sealing of one small desire on their part can help to buy essential things for others. 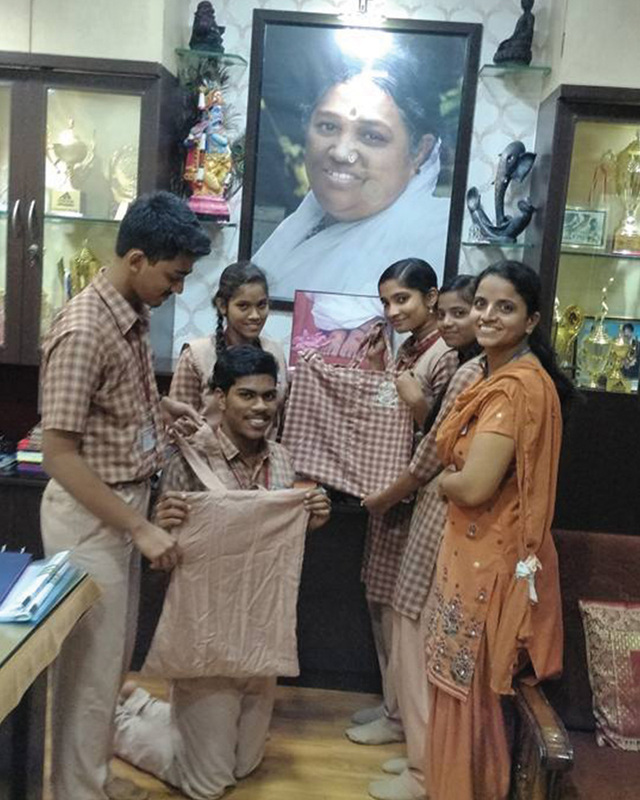 Wealth from Waste Students brought old uniform shirts which were stitched into shoulder bags. 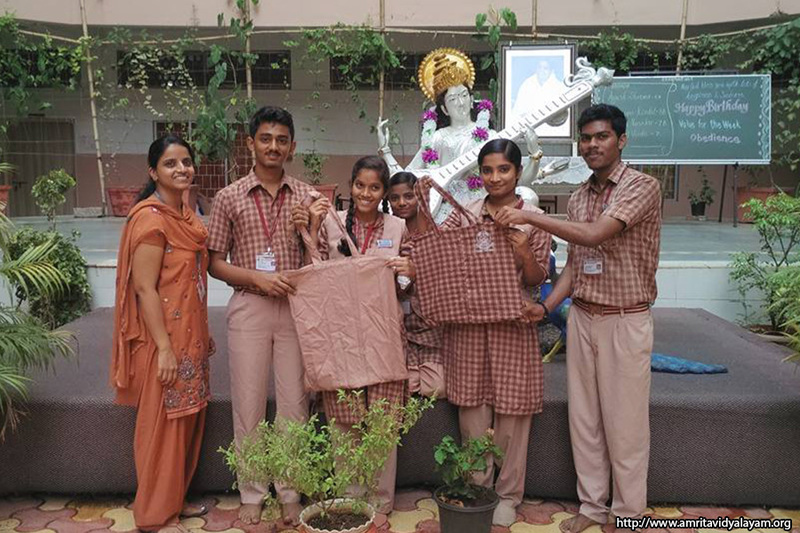 A total of 10 bags were stitched and will be distributed among needy people to spread the message of ‘reducing plastic’. 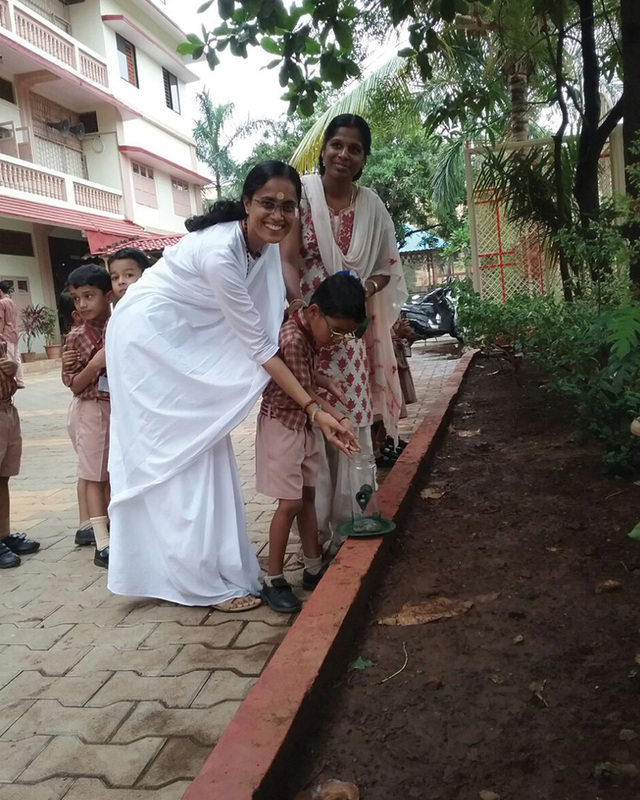 Bhoota Yajnam In order to instil a sense of responsibility towards Nature, children from pre-primary to class II were inducted into the Bhoota Yajnam Project. 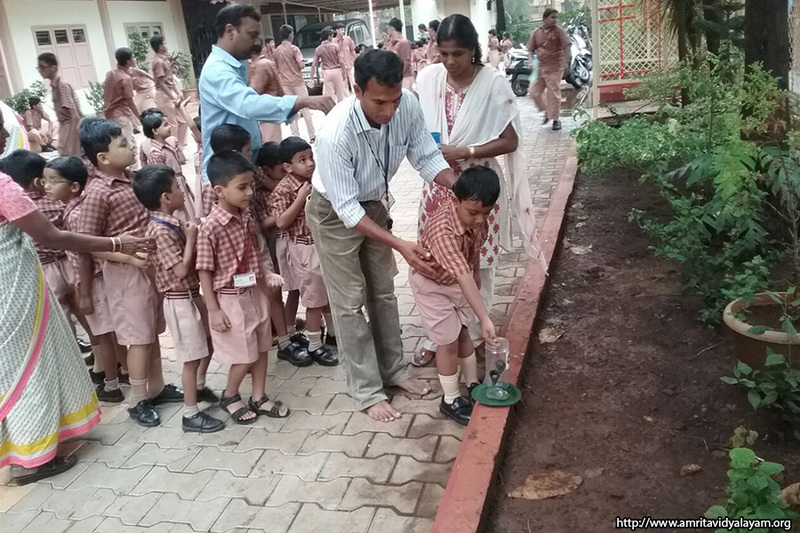 Five bird feeders and water bowls were installed in the school, and each class would bring a handful of grains on their allotted days for the birds. 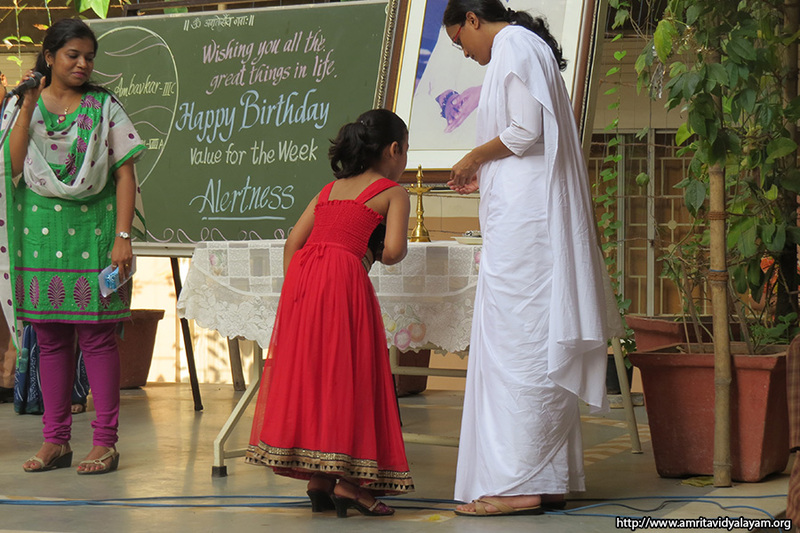 Snehamritam Birthdays of teachers, students and staff were celebrated during the school Assembly. 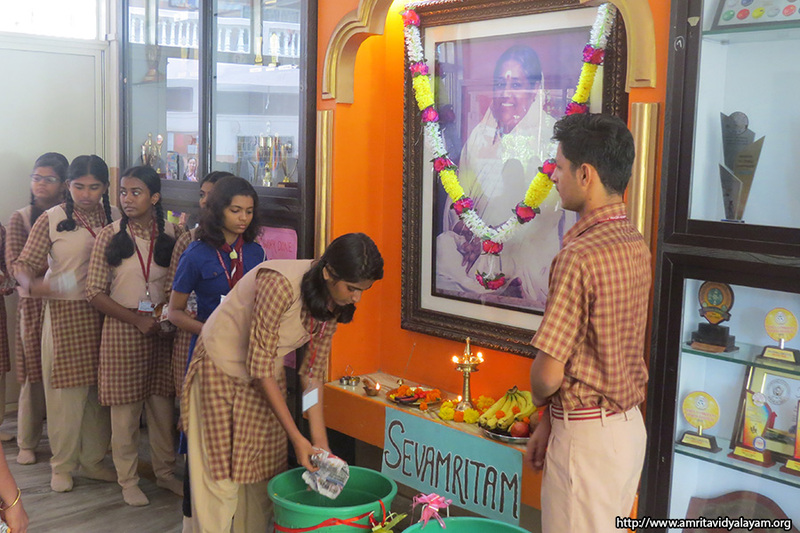 Flowers were offered at the lotus fee of “Amma”, and Principal Ma’am offered sweets to the students and teachers. There is lots of excitement as the birthday song is sung, and the celebrations bring joy to everyone. Grihamritam Just as charity begins at home, service also begins at home. The emphasis of the Grihamritam Project is on helping one’s parents in every possible way, helping to inculcate a sense of responsibility and awareness in the minds of students. 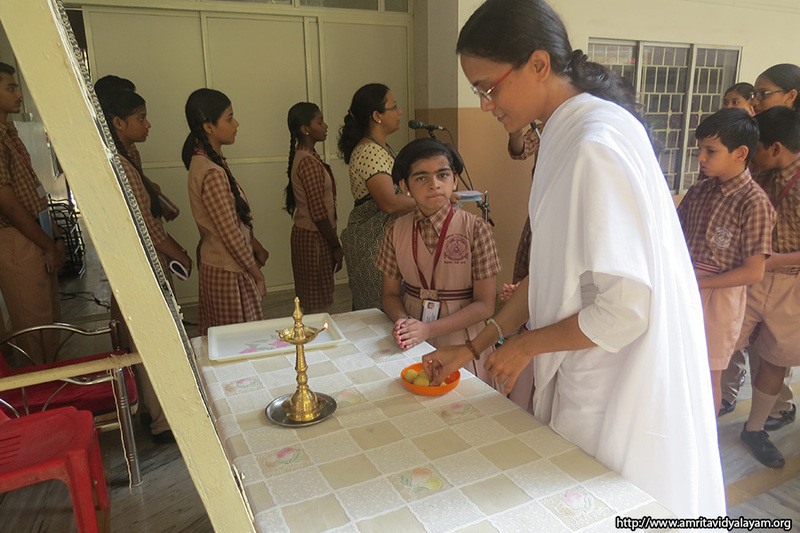 Students from VI to XII were given the small task of washing their own plates, spoons and glasses for two weeks at home to ensure that it is not just a one day job, but a practice that will become a habit. Reports from parents were requested in order to make sure that they were also aware of the task given to their children and would encourage them.